06.30 am. Depature from Guatemala City to Mundo Maya Airport in Flores Petén. 07.30 am. Arrival to Flores, where a representative will be specting you in order to move into the hotel and then to the National Park of Tikal. 10.00 am. 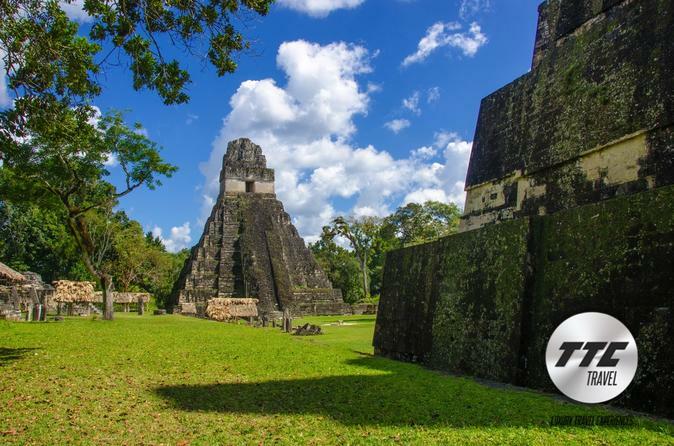 Arrival to The National Park of Tikal where the journey of this beautiful history will start; in the city of Tikal will be visiting some places as: Q Complex, The Central Acrópolis, The South Acrópolis, The Big Plaza, Temple IV and the Lost World Complex. 01.00 pm. Lunch with out drinks. 03.00 pm. End; depature to your hotel. Until the depature time from the flight you can visit the Flores City and their sorrunders, know quite bit more from the history of the island, or even take a walk on Flores City, you can visit as well the Flores Lake. 04.45 pm. A representative will be specting you at your Hotel Lobby to take you back to Mundo Maya Airport. 06.30 pm. Depature time to Guatemala City and then the shuttle to your Hotel.